This morning we awoke to a blanket of fog. I have always enjoyed foggy days. We used to have many on the shore in Nova Scotia. 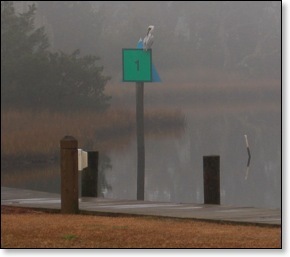 Fog seems somewhat rare on the Crystal Coast. I would guess that our Blue Ridge mountain home in Roanoke, Virginia actually experiences more fog than we do down here on the coast. I suspect the reason we aren't fogged in more is that our coastal waters are never too far from our air temperatures most days. It seems that we need a differential of twenty degrees or more between air and water temperatures before we get significant fog. Later this week we are expecting a couple of days of very cool weather. That will let us see another coastal phenomenon, steaming waters. This happened a couple of times last year. When the air temperatures got into the twenties while the water temperature was still in the fifties, fog or what I like to call steam would rise off of the water. The weather is setting us up for a good opportunity to see some steaming water on Wednesday morning. We might even get a little ice on Raymond's Gut like we did last year. I have been writing about Carteret County for a long time. About eighteen months ago, I started my Daily Record Blog. As sometimes happens in technology, the weight of the past makes change necessary. Just as sometimes it is necessary to buy a new computer because your hard drive is too full, I find it necessary to move on to a new blog. I tried podcasts and movies in my old blog. While they were nice, they slowed updating the blog to the point that I stopped writing for a month. I plan to get back to regular posts about what I see and hear in Carteret County. 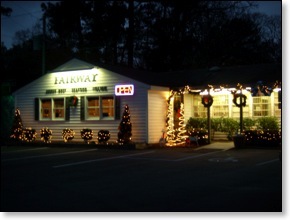 My first snippet of news is that one of my favorite restaurants, The Fairway on Route 58 in Cape Carteret has closed for renovations. The last 2007 meals were served on Saturday December 22. I had one of my favorites, Pork Supreme. I will have to wait until February 3rd to enjoy some more Fairway cooking. On another note, I know there are lots of questions about Cannonsgate, the new development on Bogue Sound along Highway 24. I can tell you the project is moving forward and that construction on the Post Office and Clubhouse is progressing daily. The expectation is that the first homes in Cannonsgate will be under construction early in the new year. Here are some pictures taken around the beautiful marina. I will be posting more pictures after I get another sunny day.